I’m finally back from my little hiatus. We’re settled into our new apartment in Virginia and I’m ready to start cooking again. I was ready to start last week but after two things I tried to bake burnt to a crisp and set off the smoke alarm, it became apparent that the oven was broken. Luckily, the maintenance guy was able to fix it after he ordered a new part and now my oven stays at the right temperature (which I verified with an new oven thermometer, I’m not taking anymore chances with burning the house down). But while I work on getting some new recipes under my belt, I wanted to finish posting things that I made this past summer. You may have noticed I have a thing for black and white desserts (see Black and White Chocolate Cheesecake Supreme, Black and White Cupcakes and Cheesecake Brownies), so when I saw Black and White Cake Cookies in my new Cooking Light cookbook, I knew I had to try them. These cookies are extremely simple to make. They are soft in the middle (hence being called “cake” cookies) and a little crisp around the edges. The frosting is really what makes them good, otherwise they’d just be boring vanilla cookies. After eating a few, I started referring to them as “Poor man’s Milanos”. They don’t have the same crispy texture of a Milano cookie, but they have the same kind of taste and they are definitely much lighter than a Milano (2g fat, 100 calories). Basically, if you are really craving a Milano, but don’t want to totally ruin your diet, these are a really good substitute. But what I think really takes these from just-ok cookies, to these-are-so-good cookies is the flavor of the white frosting. 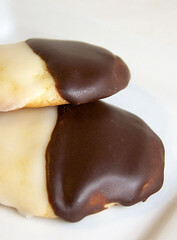 I left the chocolate alone, but the recipe says to use almond extract to flavor the white icing. I don’t like almond and substituting vanilla sounded really boring to me, so I decided to divide up the white frosting into two bowls and I added orange extract to one and peppermint extract to the other. Both of those flavors paired really well with the chocolate and I couldn’t decide which one I liked more. The flavoring is really what brings these cookies to a whole new level so you should have fun with them and use whatever extracts you like best. The recipe is below, but one little bit of housekeeping that I wanted to mention is that during my little hiatus I was asked by the lovely people at SpringPad to partner with them, so now the majority of my recipes are on SpringPad and you can easily add them to your own account by clicking on the little yellow box icon at the bottom of each post that says “Save it”. 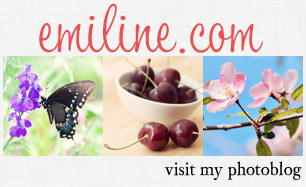 And if you have an account, you can follow me here: http://my.springpadit.com/Emiline220, I’ll follow you back! And if you don’t have a SpringPad account, I would highly recommend checking them out. I used to use a bunch of different applications to organize work stuff, personal stuff and cooking stuff and with SpringPad I finally found a place where I can put it all together. I started using it to share and find recipes (there’s a big community of food bloggers on there already), but it has all these other great apps to help you get organized and I’m using it more and more lately. I store my personal and work to do lists there, I keep track of all my work project notes and how much time I work on each project. I’m also using it to keep track of my diet, my wishlist, and my grocery list. If you are looking for something to help organize your life, SpringPad is a great tool. 1. Preheat oven to 375 degrees (F). Spoon applesauce into a fine sieve over a bowl and let sit for 15 minutes until the liquid has drained through. Discard the liquid. 2. Combine flour, baking powder and salt into a bowl. Set aside. 3. Combine butter, sugar and drained applesauce into a large bowl and beat with a mixer until well blended. Beat in vanilla and egg whites. Add in the flour mixture and beat a low speed until blended. 4. Line a baking sheet with parchment. Drop level tablespoons of dough onto sheet, about 2 inches apart. Bake for 10 minutes or until set but not browned. Cool on sheet for 2 minutes and then transfer to wire racks to finish cooling. 5. When the cookies are mostly cooled start making the frosting. 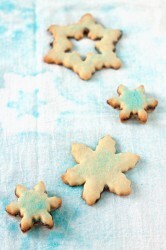 For the white frosting, combine sugar, milk and extract in a bowl and stir until smooth. 6. Take one cookie at at time and spread about 1 tsp. of the white frosting over half the cookie. Put it back on the rack to set and repeat with the rest of the cookies. 7. When the white frosting is set (after at least 10 minutes), make the chocolate frosting by combining the sugar, cocoa and milk and stirring until smooth. Spread 1 tsp. over the other half of each cookie and put back on the rack to set. What kind of oven thermometer did you get? Can I use dark chocolate for the chocolate frosting? I got it from Target. There wasn’t much to choose from, so I got the nicest one, but it was still only 10 bucks. I grew up with these and they are famous in NY (started there). 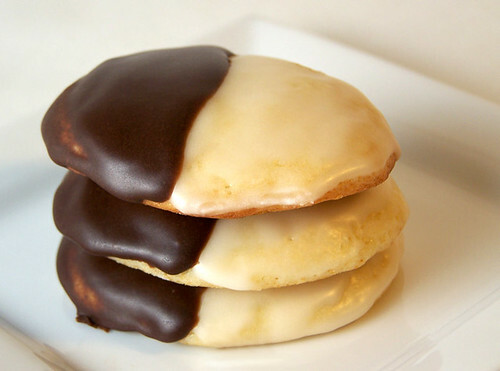 They were known as “black & white cookies” and later known as “half-moon cookies”. Thanks for the recipe! !